I haven’t posted to this blog for a while, because of other commitments. Now that things have gotten a little easier, I’m back to posting some things. Here is another installment of my family history: the Strobel family. John and Emma Strobel, c. 1930. My dad said he took the picture. When I was a teenager, I traced my mother’s side of the family, and then I hoped to write up a Strobel family tree. But then I went to college, became involved in other things, and drifted away from genealogy. Also, all my Strobel great-aunts and -uncles were deceased by 1961, when I was 4, and so I lacked that whole generation to interview. Such interviews had been crucial when I traced the Crawfords. But I did trace my grandfather’s generation (he is number eight below) and the names of my father’s generation. Why is my name “Stroble” and all these people are named “Strobel”? Because my grandfather spelled the name both ways, and that was the way he spelled the name for my dad’s birth certificate. Grandfather’s tombstone has Stroble and his obituary has Strobel. In those days, you could spell your name as you wished, I suppose. 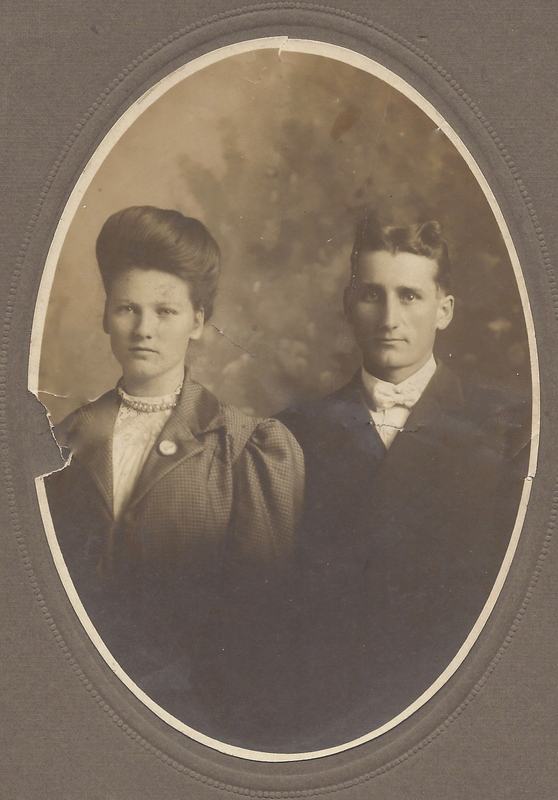 Here are my great-grandparents: John Strobel, b. Jan. 1, 1840, d. Aug 26, 1932. He married Emma Hotz, b. July 7, 1846, d. July 7, 1937. They married June 20, 1865. Their children: Mary, Lena, John, Ann, George, Charles, Amelia, Andrew, Gustave, Edward. 6. Charles Nicholas Strobel, Nov. 5, 1876 till Nov. 27, 1961. Married Lillie E. Watkins, May 7, 1886 till Jan. 20, 1949. Their children: Tina, Leta, Jesse, Evalena, Donna, Delmar, Fred, Charles, Virgil, June. I want to add here that Dad was close to his first cousins in this family branch. 7. 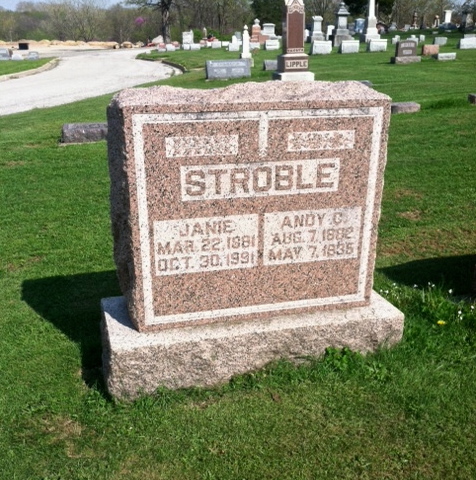 Amelia Strobel, August 20, 1880 till Sept. 7, 1961. Married Charles Holman, Oct. 11, 1877 till Oct. 1, 1951. Children: Van, Ethel, Paul, Leo, John, Mildred, Lucille, two infants, Gwendolyn and Leonard (twins, surnamed Holdman), Helen Mae (surnamed Holdman). 8. Andrew Christian Strobel, born Aug,7, 1882, died May 7, 1935. Married Permelia Jane Carson, March 22, 1890, d. Oct. 30, 1991. Her family, the Carsons and Colburns, are described elsewhere in this blog. Andy and Janie’s children: Paul (my dad) and Mary Gladys. 9. Gustave Strobel, Nov. 24, 1884 till Nov. 22, 1885. 10. James Edward Strobel, Oct. 12, 1887, Jan. 27, 1961. A World War I veteran, he never married, and was known locally for his horses. A person on the “Vandalia Memories” Facebook page wondered if I was any relation to Ed Strobel, because he was such a nice person and he let her ride his horses when she was little. need to write about for this blog) includes a historian of the tragic Black Hawk War in 1832. Other branches from Scotland, Ireland, and Wales arrived before the Revolution. The Strobel branch, however, came much later, in the 1840s, reflecting that great emigration from the German states in the mid 19th century. They were also German Catholic, not a popular immigrant group among some Protestants at the time, which makes me wonder what kinds of experiences they had in Illinois. They were the last of my family groups to arrive in America. Though they first settled in Madison County, Illinois, John and Emma eventually moved over to Fayette County, IL, in time for my grandfather to be born there in 1882. And so by 1882, all of my family groups were in place in Fayette County, where I was eventually born and raised. I’ll think about my grandfather this coming May 7th, the 80th anniversary of his death. He and my dad (who was 22 in 1935) walked together among the stores on S. Fifth Street in Vandalia, and Andy “just caught the door handle and fell,” in Dad’s words. He died of a stroke, age 52. “Everyone knew Dad, and liked him,” my father would say wistfully, and I’ve always wondered what nice times Andy and I missed because our lives did not overlap.